DBA: Welcome to the Doncaster Book Award! Welcome to the Doncaster Book Award! Books Are Amazing!! Celebrate the joy of reading with us once again this year – there’s so much here for you to enjoy! Just added: Winners Announced | Panto in a Day | Shortlists Announced! | Amazing Viking Art Competition! New Book Lists for 2018/19 | What's Going On This Year? | How Do I Take Part? Winners Announced at our Fantastic Finale! 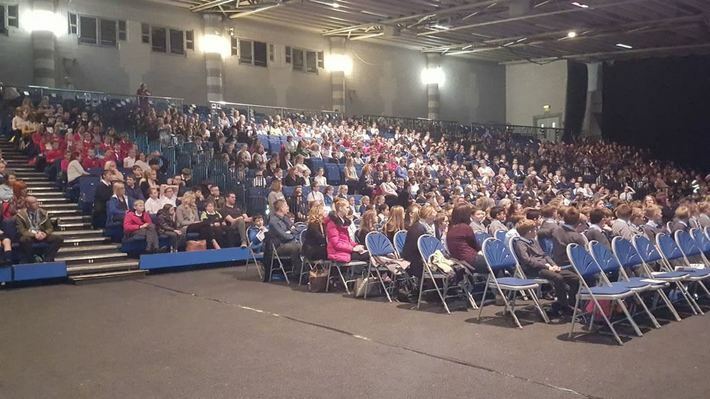 The winners of the 2019 Doncaster Book Award were announced at our amazing Finale at the Doncaster Dome on Thursday 11th April 2019. Another year, another magical celebration of children’s books at the Doncaster Dome, in a day absolutely jam-packed with excitement and fun. Our special guests this year were authors Janina Ramirez and David Solomons, popular illustrator Liz Million and, a first for the DBA, Jofor’s Hall Viking re-enactment group, appearing in full costume complete with weapons! Almost 30 young people from 12 local schools and the home-educated community arrived at The Point Arts centre on a sunny February Friday all ready to flex their dramatic muscles with our friends from the Talegate Theatre company on a new and exciting production of 'Jack and the Beanstalk'. 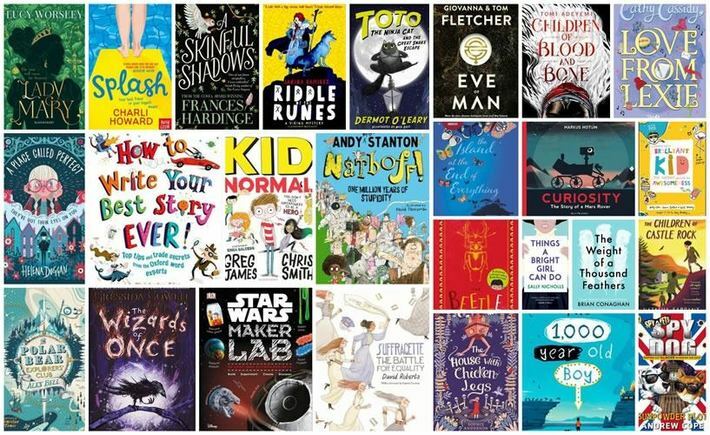 The shortlists for the 2019 Doncaster Book Award have been announced! Did your favourite make it? Which books will win? The winners will be announced at our Finale Event at the Doncaster Dome on 11th April. We want our readers to design a Viking shield. 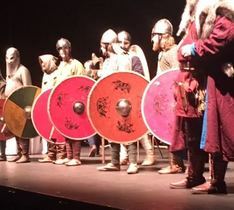 It will be judged by the Jorfor's Hall Viking Re-enactment group, who are going to be at the finale on 11th April, and the winning shield will be made to scale and presented to the winner at the finale (we hope they will be there!) Yes - the winning design WILL be made into a shield. The closing date is Thursday 28th March. Full Details on our Competitions page! On Thursday 11th October 2018 the DBA played host to three absolutely brilliant authors in what was definitely one of our best events ever. The Dome was filled with well over 1000 cheering, clapping and laughing children as Andy Stanton, Martin Brown and Andy Cope demonstrated once again the power of books to stir imaginations, inform and entertain and the sheer joy of reading. Check out our fabulous new book lists. You’ll find books there from some of your most popular authors and discover some new favourites too. Lose yourself in these amazing stories. You can step into new worlds of magic and mystery, laugh and cry alongside the characters on their thrilling adventures, solve puzzles and explore magical realms. Most importantly: tell us what you think. We love to see your thoughts and opinions on the books you are reading, so post your reviews here on your website. Remember, you, the readers, are in charge and your votes alone will decide the shortlist and the winners! You might even win a prize in our brand-new ‘Review of the Month’ competition. Our Events page has details of some of the amazing events we held last year, and this year’s events will be as fabulous as ever. Starting with our exciting launch event at Doncaster Dome on 11th October 2018, we’ve got another fun-packed year planned. Keep checking this website for details of what’s happening, and when, where and how you can join us! Just some of the audience at our amazing 2017 Launch. Help us make this year's even bigger! Everyone is welcome to join in the DBA! Speak to your teacher or school librarian to see if your school is already involved. If not, don’t panic!! You can still read the books for free from your local public library, post reviews and comments here on this website, and find out details of all up-coming events. If you are a teacher who wants to join in, please contact Lynne Coppendale, our Schools Co-ordinator, who will tell you everything you need to know to get you started. Come and join us! I look forward to meeting lots of you again this year. Don’t delay, start reading today!! Secretary, Doncaster Book Awards Ltd. The Doncaster Book Award strives to promote reading for pleasure among our young people, in order to create a positive attitude towards books and reading and to extend reading choices. This will, in turn, lead to improved literacy levels, better educational outcomes and thus improve future economic prospects for Doncaster’s children. We also strive to provide children with opportunities for new and exciting experiences based around books and reading, to encourage positive social interaction between young people from all parts of the Borough and thus help make Doncaster a thriving reading community. Find out what it's all about, meet our team, view our longlists and check out our events! We are on Twitter! Why not follow @DoncBookAward for regular updates?